The Best Global Warming blogs from thousands of top Global Warming blogs in our index using search and social metrics. Data will be refreshed once a week. Also check out Global Warming Youtube Channels. Global Warming newsletter is a comprehensive summary of the day's most important blog posts and news articles from the best Global Warming websites on the web, and delivered to your email inbox each morning. To subscribe, simply provide us with your email address. Australia About Blog Skeptical Science examines the science and arguments of global warming skepticism. Common objections like 'global warming is caused by the sun', 'temperature has changed naturally in the past' or 'other planets are warming too' are examined to see what the science really says. Facebook fans 191,911. Twitter followers 18,749. Mountain View, CA About Blog Comprehensive up-to-date news coverage about Global warming, aggregated from sources all over the world by Google News. San Francisco, CA About Blog Discussions, news about Global warming, global weirding, and what we should do about it. Facebook fans 1,072,511. Twitter followers 460,955. New York City About Blog The New York Times: Find breaking news, multimedia, reviews & opinion on Global Warming & Climate Change. Facebook fans 16,573,537. Twitter followers 42,191,792. London About Blog Latest news and features focusing on climate change happening right now, and what we can all do to help protect the planet from The Guardian, world's leading liberal voice. Facebook fans 8,031,486. Twitter followers 7,332,421. Pasadena, California, USA About Blog Global Climate Change is a premiere resource for accurate and timely news and information about Earth's changing climate, along with current data and visualizations, presented from the unique perspective of NASA, the world's leading climate research agency. Facebook fans 1,310,145. Twitter followers 321,175. Germany About Blog This blog is about the climate news from Germany by Pierre L. Gosselin. About Blog RealClimate is a commentary site on climate science by working climate scientists for the interested public and journalists. Facebook fans n/a. Twitter followers 6,503. About Blog A blog about sea level, global warming, sea records. About Blog Blog about Global warming, climate change law by Columbia Law School. Facebook fans 12,946. Twitter followers 4,420. About Blog The Union of Concerned Scientists puts rigorous, independent science to work to solve our planet's most pressing problems. This blog is on on independent science and practical solutions taken on such environmental problems like Global warming, climatic change etc. Facebook fans 182,524. Twitter followers 41,549. United States About Blog Science and environmental news featuring journal reviews, papers, renewables, ecology, politics, government, new technology, with a focus on global warming. Facebook fans 2,388. Twitter followers 4,377. About Blog Cornwall Alliance is a network of evangelical scientists, economists, and theologians promoting environmental stewardship and economic development for the poor built on Biblical principles. We promote climate and energy policy that benefits both the natural world and the poor. Facebook fans 4,263. Twitter followers 1,061. Facebook fans 760. Twitter followers 2,031. About Blog A blog about Global warming, climatic change, temperature change, etc. Facebook fans 953. Twitter followers 945. Riverside, CA About Blog In this blog you can read about many things here: from math to physics to earth science and biology, computer science and the technologies of today and tomorrow—but in general, centered around the theme of what scientists, engineers and programmers can do to help save a planet in crisis. Facebook fans n/a. Twitter followers 9,140. Mount Beauty About Blog A blog about Global warming and climate change. Eavesdropping on the deniosphere, its weird pseudo-science and crazy conspiracy whoppers. Facebook fans 297. Twitter followers 1,198. New York, USA About Blog Stay up to date with Mother nature's climate change articles. Learn more about global warming and many other environmental issues and Climate change news. Facebook fans 194. Twitter followers 6,224. San Francisco About Blog Global Warming is Real is published to help raise awareness of the reality before us. We work hard to aggregate and synthesize the latest news and information together in one place for our readers. Climate change, energy, sustainability. Get the facts and learn about the solutions. Facebook fans 2,752. Twitter followers 1,925. About Blog We Want Climate Action Now. We have no time to waste. We must act now to reduce the heating of our planet. To limit climate change to 1.5 degrees Centigrade we must act now, today not tomorrow. Climate catastrophe is imminent. About Blog To Obtain Full Information about Effects of global Warming and Climate Change News from Our Popular Website. Facebook fans 103. Twitter followers 32. California, USA About Blog Job One for Humanity is a non-profit with an effective new plan for how to slow, lessen and survive global warming. It is based on current science and it provides practical, prioritized action steps you can start today and make a difference. Facebook fans 597. Twitter followers 356. Facebook fans n/a. Twitter followers 1,684. UK About Blog Campaign against Climate Change (CCC) pushes for the urgent and radical action we need to prevent the catastrophic destabilisation of the global climate. Facebook fans 4,727. Twitter followers 6,679. Melbourne About Blog John Englart write on the effects of human induced climate change, sea level rise, ocean acidification, biodiversity loss, environmental and social impacts of global warming, and climate protests. He is member of environmental NGOs and community groups for 30 years. Facebook fans n/a. Twitter followers 3,062. About Blog "Global warming" could be the most costly scare story in the history of man. It is hysterical alarm built on exaggeration and deceit, fuelled by those with a vested interest. About Blog The Arctic-News Blog describes the situation in the Arctic, focusing especially on the threat of large abrupt methane eruptions from the Arctic Ocean seafloor. Contributors to the blog all share a deep concern about the way climate change is unfolding in the Arctic and the threat that this poses for the world at large. Facebook fans 1,852. Twitter followers 1,081. Dublin About Blog ThinkOrSwim is a blog focusing on the inter-related crises involving climate change, sustainability, resource depletion, energy and biodiversity loss. Facebook fans n/a. Twitter followers 6,386. South Africa About Blog Earth Report -Global Disaster Watch. Posts on Global Warming by Peter. New Orleans About Blog A blog by Bob Breck about Global warming, climatic change etc. Facebook fans 59,869. Twitter followers 3,976. About Blog News related to climate change aggregated daily by David Landskov. Keeping you updated on the latest climate change and environment news. Facebook fans n/a. Twitter followers 20,857. About Blog PrimaMundi embodies and is concerned with Connecting Causes for Earth and Humanity, The Climate Tipping Point, Motivating the Change, Green Business, Climate Change, Carbon Footprint, Sustainability, Urban Action Steps, Evolutionary Environment, etc. Facebook fans 92. Twitter followers 117. About Blog This blog has continued and expanded discussions of all aspects of climate change can be displayed. A complete list of the titles of each of these posts is provided below and partial lists are provided in the right margins of all pages. About Blog Hi. I am an Oceanographer working on a wide range of topics related to ocean and climate, such as El Nino – Southern Oscillation, Extreme weather events, Atlantic Meridional Overturning Circulation (AMOC), and Antarctic sea ice. I created this science blog to discuss recent science articles and news on various topics related to ocean and climate. United States About Blog The Common Constitutionalist is unique in that it offers not just conservative commentary and analysis from myself and others, but a blend of politics, history, arts, science and humor. Facebook fans 271. Twitter followers 640. About Blog The Measure is a (hopefully) weekly blog about issues relating not only to global warming and the science behind it, but also to the energy sector as well. About Blog Evidence-based forecasting for climate change. The Climate Bet site was originally created to chronicle Scott Armstrong’s $20,000 Global Warming Challenge to Al Gore to provide better forecasts than the no-change model. While the challenge still stands, The site now promotes the use of proper scientific forecasting methods for long-term global climate change policy. About Blog Discussing issues of global warming and climate change. New Haven, CT, United States About Blog This blog examines global warming and its effects. Henry Auer have strong interests in global warming, electoral reform, climate change, scientific basis, science policy, U.S regional and other related issues. About Blog Our goal is to stop or adapt to global warming. The platform globalwarmingforbusypeople.com is an independent media organization founded by editor and blogger Bill Murphy of Silicon Valley, California in late 2016. Our strategy is to grow across multifaceted publishing and advocacy platforms, and along the way add other experts on global warming. Facebook fans 73,378. Twitter followers n/a. California, USA About Blog The GBDRRRF An Umbrella Trust Fund is working to build resilience in vulnerable communities around the globe. The DRRRTF is a multi-donor partnership and grant-making financing mechanism. Its purpose is mainstreaming climate change to help achieve the Sendai Framework for Disaster Risk Reduction 2015-2030-a decade-long plan to help make the world safer from disasters caused by natural hazards and to support the implementation of the Global Climate Agreement in Paris. Netherlands About Blog Bart Verheggen's weblog on climate change issues. On this blog, I will try to give a balanced view of the scientific knowledge on climate change. I will mostly discuss general climate related issues, occasionally highlighting details that interest me, e.g. related to aerosols or the communication of climate change. Facebook fans n/a. Twitter followers 2,802. About Blog Exposing the truth about global warming hysteria. Global climate changes have been occurring for centuries. Global warming has most likely occurred in the last century, but we have recently been experiencing global cooling. There is much evidence to suggest that temperature fluctuations are part of a natural cycle of climate change, not the result of man-made causes. About Blog Articles, opinion, commentary, book reviews and media related to Eco-Imperialism, environmentalism, energy, biotechnology, the economy and more. Global About Blog Greenpeace is an independent global campaigning organisation that acts to change attitudes and behaviours to protect and conserve the environment and promote peace. Greenpeace works to: -Stop dangerous climate change and inspire an energy revolution. Facebook fans 374,100. Twitter followers 43,449. About Blog The Science and Public Policy Institute (SPPI) provides research and educational materials dedicated to sound public policy based on sound science. We support the advancement of sensible public policies rooted in rational science and economics. About Blog A blog by Jason Davis about Climate change and the crisis we face due to it. Facebook fans 285. Twitter followers n/a. About Blog This blog has skeptical thoughts on Energy, Science and Global Warming. It also interpret the “science speak” and dissect the logic of studies and reports on the science of climate change, providing understandable explanations for the non-scientist and alternative interpretations of results that you won't get from the AGW crowd. Newcastle Upon Tyne, England About Blog Posts about Global warming written by leftgreen70. Interglacial, California About Blog A blog about Global warming, temperature change, environmental protection etc. Facebook fans 149. Twitter followers 286. London About Blog The Global Warming Policy Foundation is unique. We are an all-party and non-party think tank and a registered educational charity which, while open-minded on the contested science of global warming, is deeply concerned about the costs and other implications of many of the policies currently being advocated. DE, United States About Blog Chad Tolman have a B.S. degree in chemistry at MIT and a PhD in physical chemistry at UC Berkeley. He have done industrial research, taught at the University of DE, and worked as a Program Officer at NSF and NRC. He have served on the Delaware Governor's Energy Advisory Council and the Delaware Sea Level Rise Advisory Committee. Washington D.C. About Blog Climate Change News & Analysis by Cei.org. Facebook fans n/a. Twitter followers 1,008. About Blog This website is dedicated to educating the public on the subject of human-caused global warming. The articles are rebuttals of talking points that those who disbelieve in global warming give to the public. New York, New York About Blog Environmental Defense Fund is dedicated to protecting the environmental rights of all people, including future generations. Among these rights are access to clean air and water, healthy and nourishing food, and flourishing ecosystems. Facebook fans 286,027. Twitter followers 147,315. About Blog A blog by ICCE about Global warming and how we can avoid Global warming and climatic change. Facebook fans 2,032. Twitter followers 21. 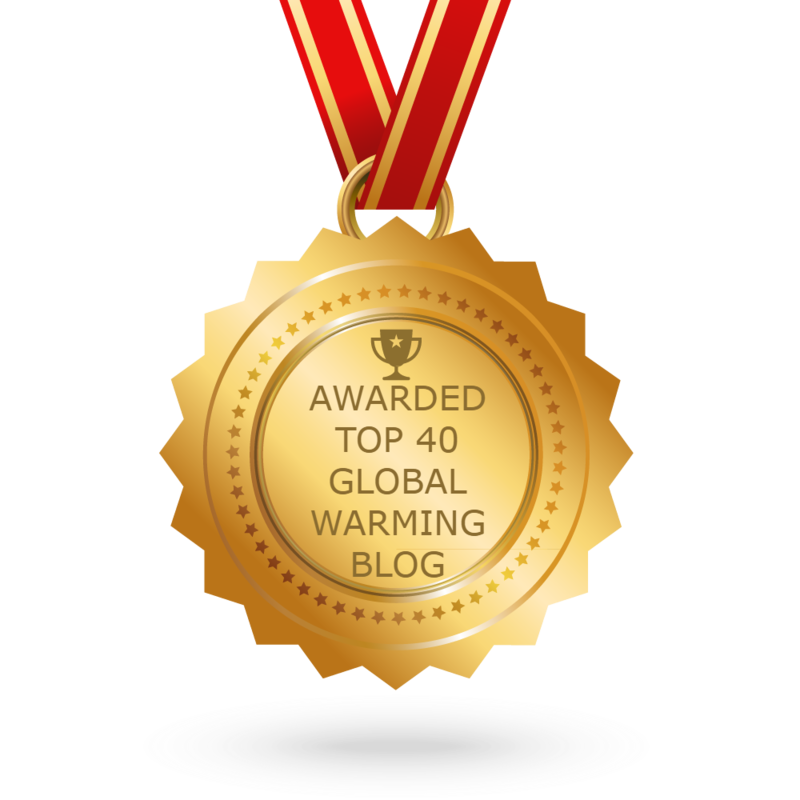 CONGRATULATIONS to every blogger that has made this Top Global Warming Blogs list! 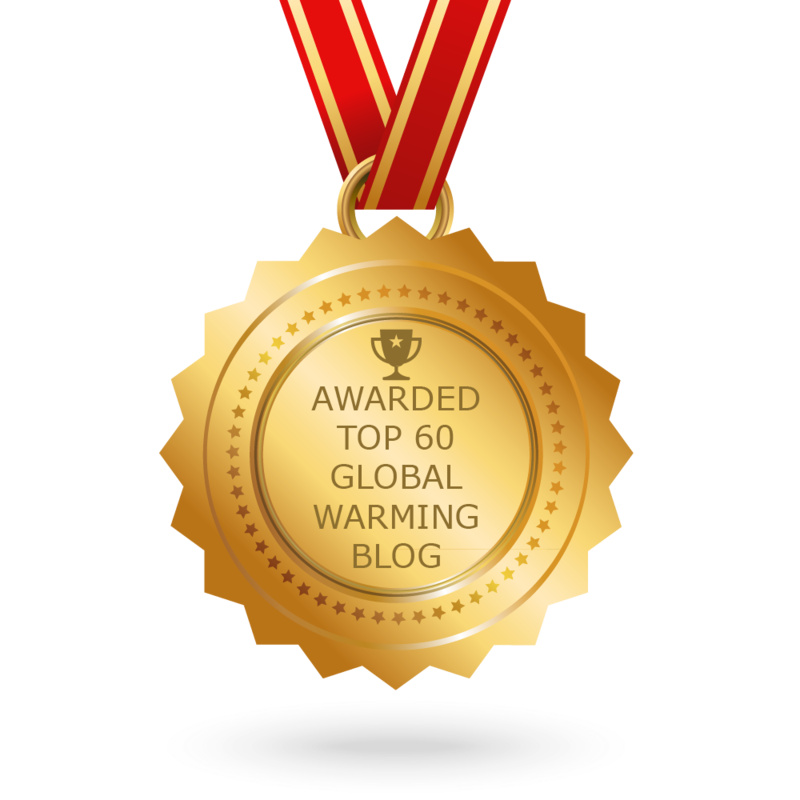 This is the most comprehensive list of best Global Warming blogs on the internet and I’m honoured to have you as part of this! I personally give you a high-five and want to thank you for your contribution to this world.